Garlic is easy to roast and the result is delicious, either roasted plain with olive oil, salt, and pepper, or add herbs for extra flavor. Using a whole clove, cut off the top and peel away any loose papery skins then place cut-side up on a small piece of parchment or foil. Drizzle olive oil and salt and pepper on top and twist or tie (with string) into a small package. Bake around 400 degrees for about 40 – 50 minutes. When you roast garlic, it turns much sweeter and is often both spreadable and creamy, so it becomes easy to add to things. 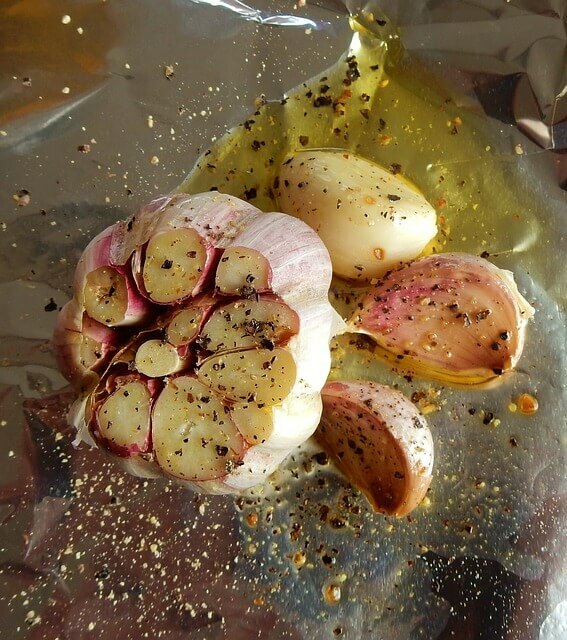 To roast garlic, simply peel the cloves and put in the oven at four hundred degrees for about forty-five minutes. If desired, a little olive oil, or pepper and salt, can be added to the garlic during roasting for even more flavor.